God is getting it off, creaming his jeans and rolling on the floor in hysterics, about his successful campaign to kill off Australians in the recent Victorian bushfire disaster. More than 210 and counting. All the dead Aussies: women, children, animals and pooftas hurled on an express plummet into the Lake o' Fire. Australia brought it on itself, says Fred, because of Heath Ledger (now also fashionably burning and screaming in Hell forever) and his fag promotin' film "Two words…..BROKEBACK MOUNTAIN!!!!" So, as befits a nation of hateful non-bible-believing fag enablers, Holy and everlasting God Almighty is killing Australians every way He can. Read all about it here. So there you have it - the Most Reverend Fred Phelps has revealed the truth. 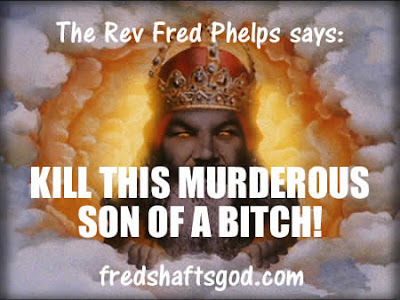 That God is a vicious, hateful, murderous, sadistic, homophobic, vile and treacherous scumbag who, I'm absolutely sure, Fred would agree should be sentenced to DEATH! Com'on Fred - you know supreme evil when you see it! Sentence God to the DEATH He clearly deserves! Throw His holier-than-thou spook body, screaming, into an industrial meat grinder! You know you want to.